Shipping Cost $6.99 Buy multiple items online from IndianOutfit to SAVE on shipping. You can return/exchange any merchandise (other than gift vouchers) within 7 days of receipt of your shipment. A 10% (min $1.00) restocking fee plus S&H will be charged for all returns and exchanges unless the item you received was damaged. To return/exchange a merchandise, please contact us within 3 days of receipt of shipment to get a Return Approval. Once approved, please make sure to post mark the return shipment within 7 days of receipt. 1. The merchandise was never altered; neither by us nor the customer. Examples of alteration include but are not limited to (a) sleeve attach (b) size fitting (c) Stitched from cloth. 2. Merchandise is a dress and not an accessory/jewellery. 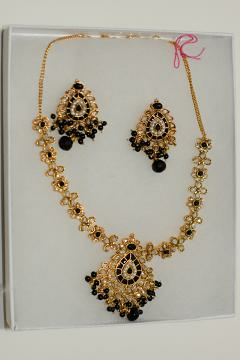 Imitation jewellery, accessory sales are final. 3. Merchandise is returned in as new condition. 4. There will be 15% restocking fee on all returns, waived if exchanging for other items from the website. 5. Shipping charges can not be returned, since those services have been provided/paid for once the item is shipped. 6. We only ship to billing addresses. We do not ship to post boxes. This item in Traditional Necklace Sets category was first added to our catalog on 12-12-2017. Buy Black White Stone Studded Golden Color Necklace Set, sold & shipped by IndianOutfit where you can shop online for Traditional Indian Clothes for Women, Men, Girls & Boys @ 50% OFF. This Necklace Sets collection has been tagged as Pendants, Gehna, Indian Jewellery, Women Costume Ornaments,Black White Stone Studded Necklace Set, Buy Studded Jewellery Jewelry, Black/ White Jewelry Shopping, Buy Jewelry Online, Wedding Jewelry Shopping. *Note: Shades of fabrics in the pictures may slightly vary from the actual fabric color. This may happen due to different display settings on your viewing device (Laptop/Mobile/Tab), or due to our digital photo shoots.